They are among the first and last faces you see on a Potters break, and your first port of call for information and enquiries. That’s why we wanted to celebrate our lovely reception team on Thursday 31st May by hosting a Reception Team Recognition Day. The Reception team and other members of staff from across Resort donned their aprons to do some baking for a cake sale, with sales from this and a raffle raising £1,244.85 for Potters Friends Foundation, a community interest company founded in memory of Brian Potter MBE, to support worthy causes in the community. Potters team of 11 receptionists, plus five porters, were treated to a delicious breakfast and lunch, and an afternoon of activities, including Zumba, by our Zumba qualified receptionist Lindsey, plus Kurling, The Giant’s Swing, a 13.5 metre 3G swing that hoists you to great heights, and The Sweeper, a Total Wipeout-inspired challenge. 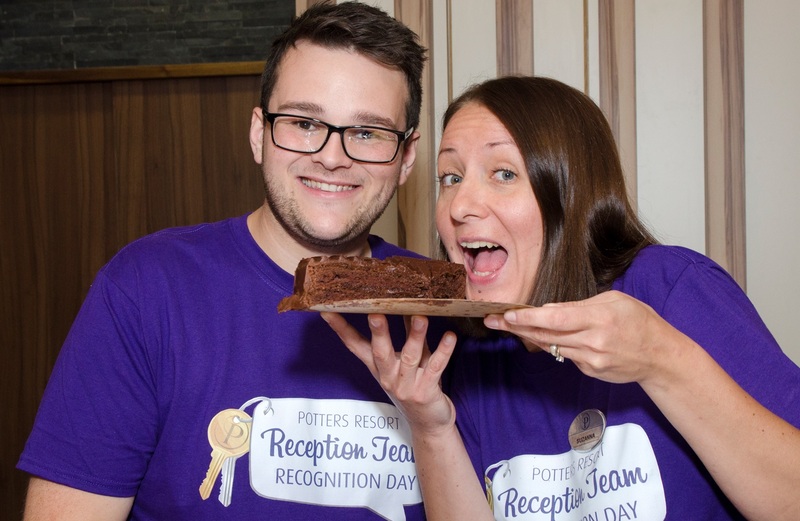 Other members of the 585-strong Potters team covered Reception, while the team enjoyed their day. A big thank you to our lovely Receptionists for doing such an excellent job and always with a smile. We hope you had a fantastic day!